The well-to-do Battlo family wanted a home like no other. For starters, they purchased a house In the center of Barcelona, along the prominent Passeig de Gracia. Their next step, hire a notable architect. 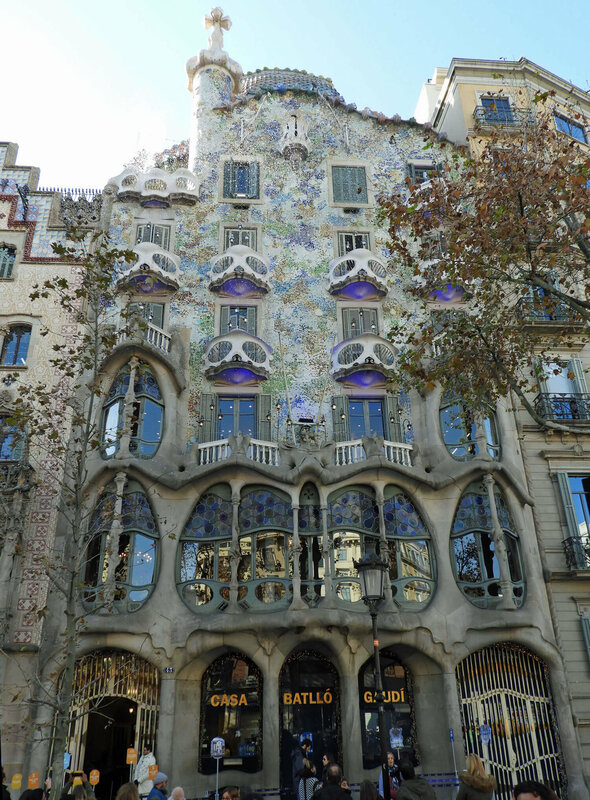 Father of Catalan Modernism and Art Nouveau, Antoni Gaudi, fit the bill. 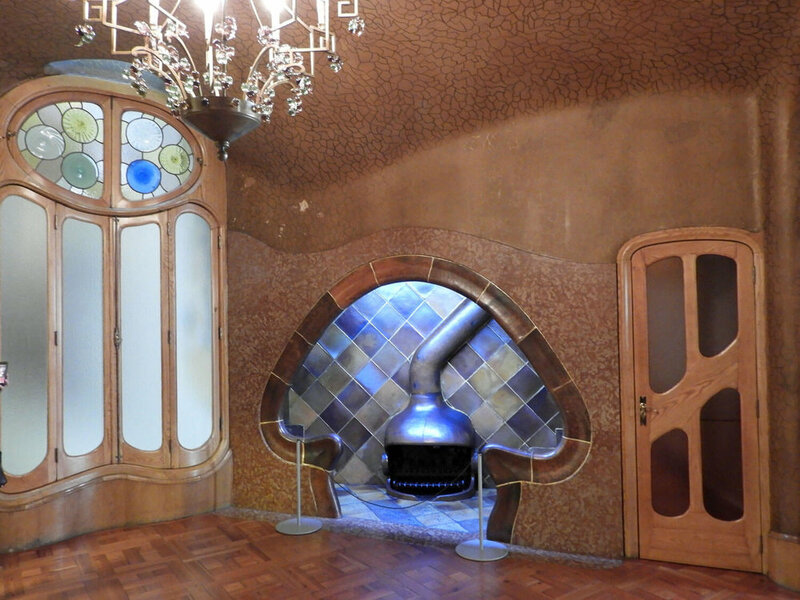 Although they wanted to demolish the existing house and build new, Gaudi convinced them that a renovation would do. Construction was complete in 1906. 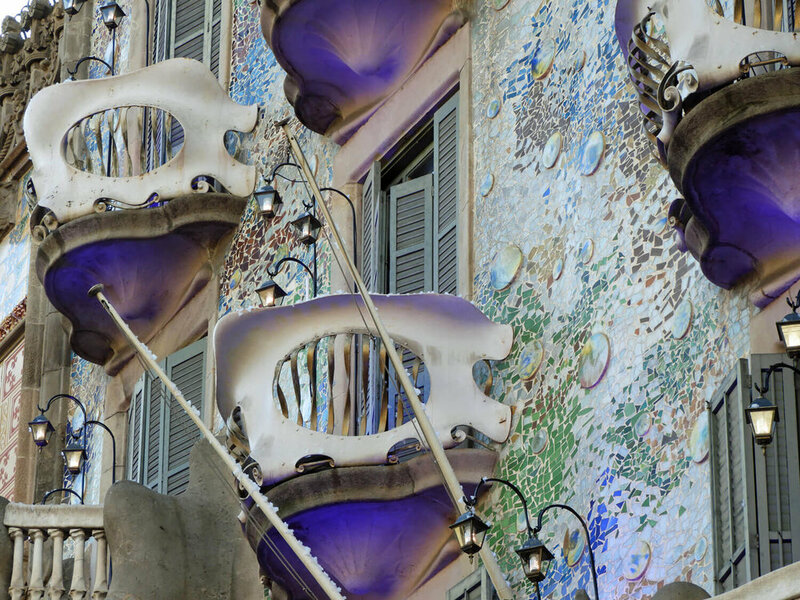 Given their wishes for originality, looks like Antoni Gaudi was the right choice for them. 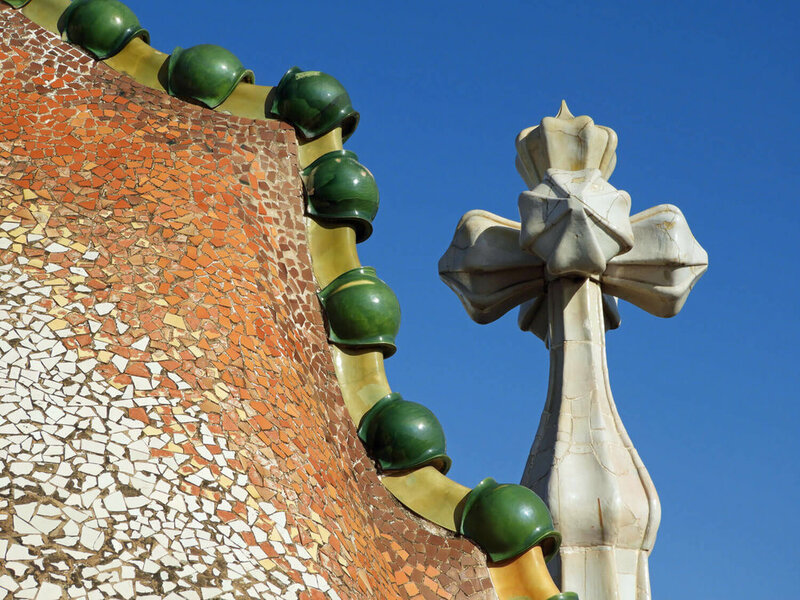 It is said that Gaudi did not want any straight lines in his projects as there are none in nature. 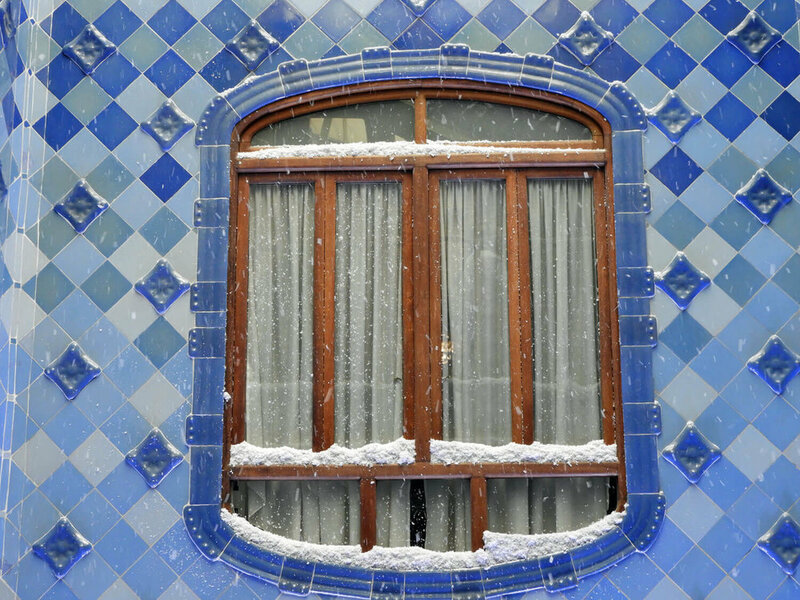 The facade of the house is adorned with a mosaic of broken ceramic tiles (trencadís), ranging from golden hues into greenish-blues. Some say the arched, scaled roof is meant to be a sculpture of St. George killing a dragon - the turret with the cross as a lance. Others know the house as "the house of bones", because the unique stone tracery work on the exterior looks similar to a skeleton. The interior of fanciful house is inspired by the sea, with sculptural ceilings that emulate tide pools and curvilinear handrails. The trencadís mosaic in the light well gradually fades from a deep blue, to a light blue - as if you are diving deeper in the sea. 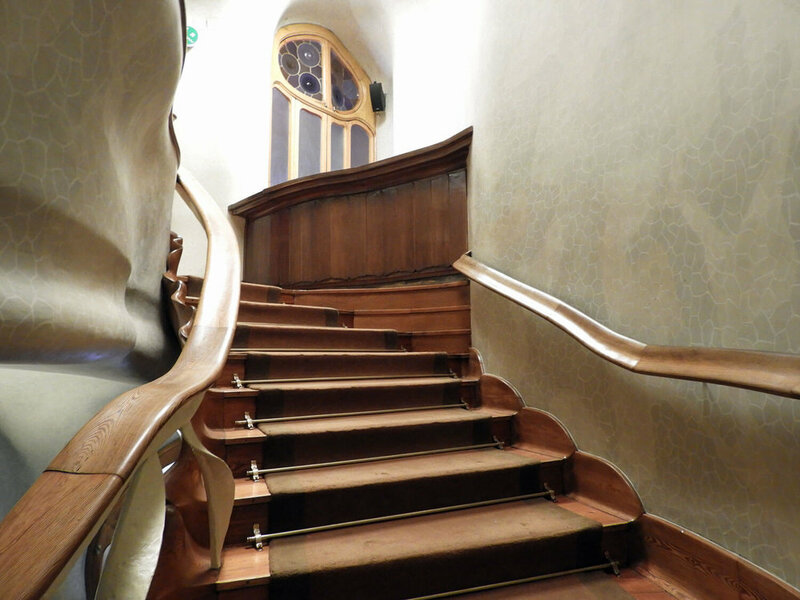 The loft of Casa Battlo was not inhabited by the Battlo family, but rather, was used by their service staff; however, it features sixty catenary arches - perhaps the rib cage of the dragon? Tickets are overpriced in our opinion (24.50, ea. ), though it is a unique site to see. Tickets are 4 euro cheaper online, though they must be purchased for a specific time. Not knowing our exact plans, we waited to purchase our tickets until the day of our visit and actually right until we were standing outside Casa Battlo. Because there was no line (Christmas week), no fast-pass ticket was necessary. It was easy to hop online and select a time frame. We only had to wait a minute or two for the email to arrive and in we went. Easy! We wouldn't advise this during the peak-tourist season, but during the off season, it worked great for us. Electronic smart/audio tours are incredibly popular these days, but it never fails that one of our devices always fails. You can always get a new device, but it's rather annoying when it dies mid-tour.